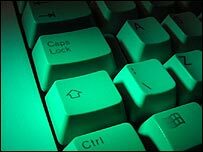 Both the Tories and Lib Dems have backed government measures to increase penalties for UK computer hackers. Anyone hacking a computer could be punished with 10 years' imprisonment under new laws. The move follows campaigning from Labour MP Tom Harris, whose ideas are now being adopted in the Police and Justice Bill. There will be a clearer outlawing of offences like denial-of-service attacks in which systems are debilitated. Typically, this is done by massively overloading the system and thereby exhausting its computing power. The bill - which was being debated for the first time in the House of Commons on Monday - would also boost the penalty for using hacking tools. Home Secretary Charles Clarke said: "We need to recognise that in our increasingly interdependent world, work with international partners to tackle terrorism and serious organised crime will be increasingly important. "One of the growing new threats that can only be tackled through extensive international cooperation is the continued threat posed by computing hacking and denial-of-service attacks." During the first debate on the legislation, Nick Herbert, for the Tories, criticised much of the rest of the bill, but said measures to tackle hacking were "perfectly sensible" and would enjoy support from across the Commons. For the Liberal Democrats, Lynne Featherstone also said there was support for measures on computer hacking, while dismissing the bill as a whole as pernicious. The bill passed on to its second reading without a vote.